I hope you are liking my THURSDAY TECHNIQUES & TIPS. My goal is for you to always be learning something new and giving it a try. If you try a technique I share, PLEASE LEAVE ME A COMMENT and let me know. I love to hear from you, especially when I share something you use! While you read this post, I am on my way to Utah for my daughter Jami’s graduation from GRAD school!!! I am one PROUD MOMMA right now! I will share pictures when I get back. As I was getting ready to leave, I ran out of time getting a technique ready to share, so I decided to just BRING BACK a very VERY old video showing a VERY old technique. But the cool thing is, this stamp set is still available and is a timeless classic. This is one of the first videos I did, over 4 years ago–so please, DO NOT LAUGH. But you can still learn from it! OK–stop laughing at the video. Actually–PLEASE LEAVE ME A COMMENT if you watched it and let me know what you think of this technique! Give it a try the next time you are stamping! The stamp used is still current and is a GO TO SET of mine when I need to send a card to encourage someone. Whether they are sick, going through tough times, or just needing a prayer! Click on either pictures below to view this lovely set and all the great stamps–especially all the WORD STAMPS! I enjoyed your video and you did great back in the day too! I had never seen that technique so it was new for me and I will try it. Have a great day. I’ve never used this technique, but I will give it a try! Thanks for sharing. 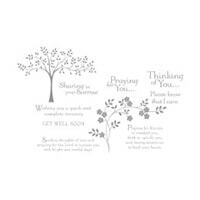 I love this card set…I’ve used it for events other than sympathy too. Nice job and a nice video. It makes the process quicker than it looks. I’ve never seen this technique….I will have to give it a try! Thanks Jackie! What a great idea. Will have to give it a try. Can’t imagine anyone laughing at your video! It was well done and the technique looks easy and has a good result-at least yours did! Thanks Sarah….it’s just such an old video. I hope I am improving!!! Watch for lots more quick and easy techniques! This is a new to me technique also. It’s definitely a keeper! I know the look is loose and free, but, I probably would use a stamp positioner. Thanks for sharing!